Now that you’ve learned a bit about writing Java applications, you might be wondering how to package them up so that other developers can use them, or how to import other developers’ code into your applications. This unit shows you how. The JDK ships with a tool called JAR, which stands for Java Archive. You use this tool to create JAR files. After you package your code into a JAR file, other developers can drop the JAR file into their projects and configure their projects to use your code. 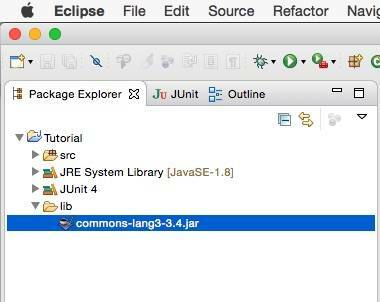 Creating a JAR file in Eclipse is easy. Watch as I take you through the steps. The JDK is comprehensive, but it doesn’t do everything you need for writing great Java code. As you grow more comfortable with writing Java applications, you might want to use more and more third-party applications to support your code. The Java open source community provides many libraries to help shore up these gaps. Suppose, for example, that you want to use Apache Commons Lang, a JDK replacement library for manipulating the core Java classes. The classes provided by Commons Lang help you manipulate arrays, create random numbers, and perform string manipulation. Right-click the Intro root folder in the Eclipse Project Explorer view. Click New > Folder and call the folder lib. In Package Explorer, select the lib folder, right-click, and select Refresh. Right-click commons-lang3-3.4 and choose Build Path > Add to Build Path. After Eclipse processes the code (that is, the class files) in the JAR file, they’re available to reference (import) from your Java code. Notice in Project Explorer that you have a new folder called Referenced Libraries that contains the commons-lang3-3.4.jar file.